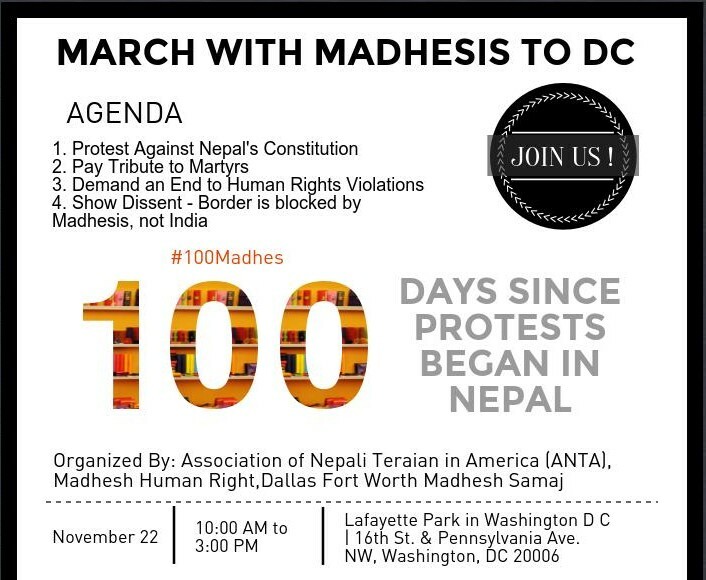 Nepalis in America are staging a protest in Washington DC on November 22nd 2015 to mark 100 days of protest in Nepal. Members from Association of Nepali Teraian in America (ANTA), Madhesh Human Right (MHR), Dallas Fort Worth Madhesh Samaj and others are organizing and participating in the event. The event will be attended by several Madhesis and is scheduled from 10:00 AM to 3:00 PM. The event mentioned above is separate from another event organized in Washginton DC around the same time by another group of Nepalis to protest against the ‘blockade’ imposed by India. The two groups of Nepalis are divided along ethnic lines and agenda, even in America. One group, consisting of mostly Madhesis are protesting against discriminatory constitution, pay tribute to martrys during Madhes Andolan, demand an end to human rights violations, and show dissent by asserting that the border is blocked by Madhesis. In contrast, the other group constituting of mainly Pahadis are protesting and have accused India of imposing a ‘blockade’ in Nepal. The agenda for the event organized by ANTA and others are as follows. – To draw attention to Nepal’s regressive and discriminatory constitution, which denies equal rights to the people of Terai-Madhesh (which represents almost 45% of Nepal’s population), the southern plain of Nepal. Visit Facebook event page to see more details. Contact Satendra Sah if you would like to join or have any feedback. The event poster shows a brief summary of the event.